Tests are exams, quizzes, and suchlike that you can take in Populi. After submitting your test, it can be graded by your instructor or—depending on how your instructor has set it up—will be automatically graded by Populi. When a test is available to take, you'll see an alert on the Course > Dashboard view. The Course > Tests view shows you a list of all the published tests. If you're allowed to access the test, you'll see a Take Now link. If a test is part of a lesson, you'll be able to get to the test via the lesson. If the lesson requires you to complete previous lessons, you cannot take the test until you are allowed to access that lesson. Availability trumps the time limit. If you begin a test with no time limit ten minutes before the availability window ends, you have only ten minutes to finish the test. If you run out of time, unanswered questions will be marked wrong. If you get accidentally logged out in the middle of taking the test, you may resume the test where you left off with any unused time remaining (unless availability runs out). Your instructor may allow you to retake the test one or more times. Taking the test more than once is entirely optional. Click the Take Now link. You'll be shown a page with information about the time limit and any remaining retakes. At the bottom of the note, click to start the test. Doing so starts the countdown on the time limit. Multiple Choice: Click the radio button (round) to select the right answer. Short Answer: Type or copy-and-paste your answer in the field. Put in Order: Drag the text bars until they are all in the correct order. Multiple Answer: Check the boxes (square) next to all appropriate answers. Essay: Like Short Answer, in that you type or copy-and-paste your answer in the field. Unlike Short Answer in that there's no character limit. True/False: Is the statement True or False? Choose whichever answer applies. Matching: For each term in the left column, select the appropriate term from the drop-down. As you enter or edit answers, Populi will automatically save them. When you're done, scroll to the bottom of the test. Press Submit Test. After submitting your test, timing out, or transgressing the availability window, you'll see the Test Completed screen. 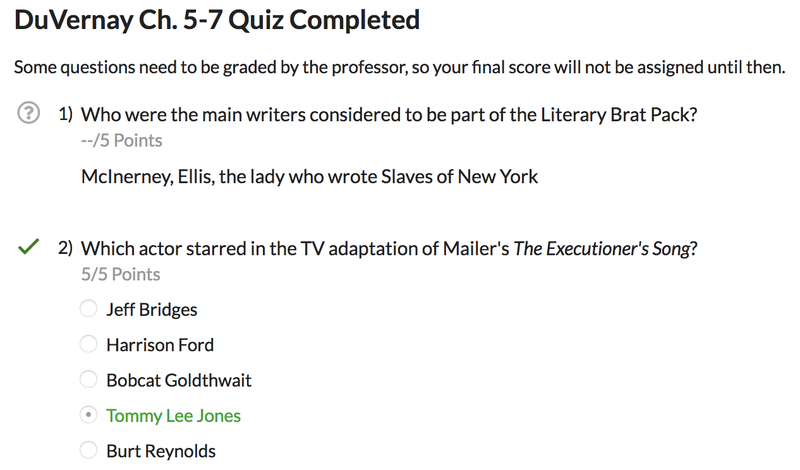 Certain question types (Multiple Choice/Answer, some Short Answer, Put-in-Order) are automatically graded. If all of the test questions are such, then you'll see your grade. If not, you'll read that Some questions need to be graded by the professor, so your final score will not be assigned until then. If retakes are permitted, you'll see how many retakes you have remaining. Retakes are optional! Your professor may make various kinds of feedback available to you after submitting the test—answer scores, correct answers, and comments. Depending on which options he's made available, you can also see these things when you look at the test's History view.